Dear friends, I will be taking part in a talk entitled “The Malayan Forum, 65 years on” next week. It’s open to all—do come! Alongside me will be moderator Lai Chee Kien and fellow panellists Tay Kheng Soon, one of Malaya’s most famous architects and Syed Khairudin Aljunied, a Malay Studies professor at NUS. We will “reflect, weigh and provide contemporary perspectives on Malaya, using the Malayan Forum of 1949 as an entry point”. 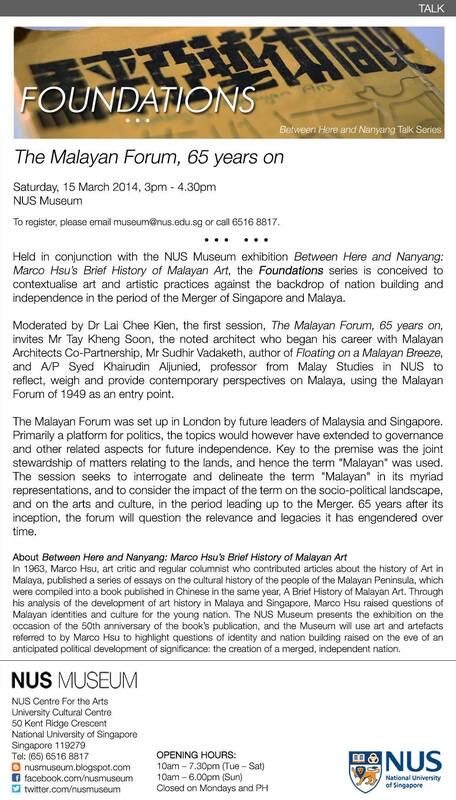 The talk is being held in conjunction with a very interesting exhibition on “Malayan Art”. « Should Singapore tax the wealthy more?